Vastly under appreciated for over half a century, the Arts and Crafts period is gleaning second looks from historians, collectors, and art enthusiasts- those who had previously discarded much of the original frames from that period in favor of the more popular, and often reproduction, French and English inspired frames. I think it is likely that many of the Artisans from the Arts and Crafts period would have been mortified to find their paintings in the very style of frame to which their frame had been created as a form of revolt! Today, this resurgence of interest in the Arts and Crafts ‘revolt’ has sparked a flame of curiosity and an endeavor to reunite paintings with original frames, or reproduction frames made to closely resemble the originals. Since so many of the original Arts and Crafts frames were routinely over-painted, stripped and refinished- or simply discarded- few original period frames of quality are extant. Therefore, to find an example of an original frame in a condition of any note is a rare find. French Rococo: just the mention of this style may bring to mind skillfully crafted and often exquisitely gilded furnishings, and indeed that is a correct view. Mention the American Arts and Crafted movement and seldom will the thought of a gilded object enter the thoughts. Truth be told, both stylistic periods have and should be known for their gilded furnishings, especially frames. While the Monarchy directly controlled the style for their reign, the Artist directly controlled the style of the Arts and Crafts period, and thus an entirely different and somewhat revolutionary style emerged. Recently, The Chicago Conservation Center had the distinct pleasure to assess and treat three unique Arts and Crafts style hand-carved frames which had sustained hurricane damage. The damage was quite severe, as may be seen in the following images: Image 1 (below, left) displays an example of the splintering effects of debris strewn through the air and against the surface of the frame; image 2 (below, center) shows the extreme loss of gold as the water sheared across the surface taking all the decoration off all the high relief and leaving most of the recessed areas intact; image 3 (below, right) shows an example of dimensional changes, caused by water saturation, to the wood causing large splits through the entire length of the board. Although the damage was severe, all three frames were deemed important enough, and intact enough, to conserve. Conservation treatment followed a standard protocol which respects the Artisans’ original intent and the original materials used during creation. Original materials were retained, revealed or left revealed as much as possible. Image 4 shows the pain-staking effort made to fill losses and leave original material uncovered and intact. Non-original over-coatings were carefully removed to reveal rich tonalities previously lost. 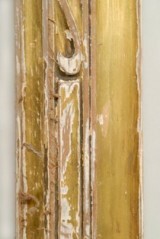 In image 5, note how the revealed gold shines and gives life to the relief of the hand carved edge. Subtle tones were investigated and recreated on filled areas to emulate originals, while originals were left visible and protected with conservation varnish (image 6). Each frame was carefully cleaned of hurricane debris, consolidated and treated to widely accepted conservation standards. All treatments for these frames spanned a period of approximately 8 to 10 months. (Above) Filling losses while leaving original finish intact. Lets talk a bit about what makes an Arts and Crafts frame different from its predecessors, shall we? Let us begin with a small comparison in technology, and all will become clear. During the Rococo, lighting technology had advanced to the use of oil lamps and candles. (I say ‘advanced’ tongue in cheek, of course, since oil lamps and candles had been the modus operandi for centuries!) It had been discovered that gold is an excellent reflector of light, therefore, the more reflective gold in an evening room setting, the more light. Gold surfaces also reflected the personages’ opulence and wealth and were intended to convey status. Now, in contrast, let us examine the technology of the Arts and Crafts period. The boon to the industrial revolution had been invented: the electric light. This boon provided more light than several candles or oil lamps, and shone with a white hot beam from one central location. Suddenly, those gilded frames, sconces and moldings were shining garishly in the cold electric light. As a form of response, many people began to paint over gilded surfaces with the more subdued bronze paints available, or thick heavy toners and paints. The Arts and Crafts bunch, wishing to revolt against the inexpensively mass- produced composition (this material may be best thought of as an early plastic like substance which was easily moldable) decorated frames, began to produce hand carved wooden frames decorated with electric lighting in mind. Toning coats were utilized on gilded and leafed surfaces in varied and creative ways to take advantage of the glaring nature of artificial light. Note especially the frame pictured (above, image 5) with a very dark toning coat and highlights on specific selected edges. This type of decoration would have been very foreboding in a room lit solely by the few small flames of candles, but in the electric environment, it is dramatic and engaging. Is it not amazing that something as seemingly simple as a light source could have such an impact upon the arts? Of course there is far more to the story of the Arts and Crafts movement than this, but it is indeed an important and interesting factor to keep in mind the next time you use your dimmer switch and light your candles.